A 320-year-old missing cello is now back with the Los Angeles Philharmonic Association, having possibly avoided becoming one of the most expensive CD racks ever. A nurse found the $3.5 million instrument made by master craftsman Antonio Stradivari lying by a trash bin — and almost had her boyfriend convert it into a CD holder, police said Tuesday. Melanie Stevens, 29, discovered the cello about a mile from where it was stolen, still inside its silver-coated plastic case. She put it in her car's trunk for two days. 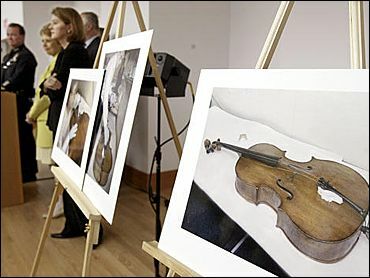 Then Stevens asked her boyfriend, a cabinetmaker, to either repair the instrument or convert it into a unique CD holder, Detective Donald Hrycyk said. She said she didn't know its significance until she noticed a news report May 7. "I had the idea to possibly put a hinge on the front. ... He would install little shelves inside," Stevens said. "It would be a very elaborate CD case. I know it sounds crazy." The philharmonic's associate principal cellist, Daniel Rothmuller, who played the instrument for more than 25 years, called the instrument's recovery "an incredible miracle. ... Can you imagine it going into a garbage truck?" Its return was a relief for philharmonic principal cellist Peter Stumpf, who accidentally left it outside his home. Nearby video surveillance cameras showed a bicyclist stole it April 25. "It's been an enormous weight on me for the last three weeks," Stumpf said. "I'm just incredibly relieved that it's solved." However, detectives are still looking for the thief and have not ruled out any suspects. They plan an investigation before deciding whether to give Stevens the $50,000 reward offered by an anonymous donor, Hrycyk said. The prospect that the prized instrument could have been turned into a CD holder "is so abominable. I get sick when I hear it," said Robert Cauer, a Los Angeles-based expert instrument restorer. The 1684 cello was one of only about 60 made by Stradivari in his Cremona, Italy, workshop. The philharmonic association bought it about three decades ago. It is cracked on the front, back and upper rib, but there is no crack in the critical rear soundpost, said Robert Cauer, a Los Angeles-based expert instrument restorer. He said the cello, which had been cracked before, should be ready for play by October. Stevens said she hired an attorney because she wanted to get the cello to authorities and feared people would question her story. Stevens said if she receives the reward money, she will "happily, graciously take it," to start a music appreciation foundation for children.